and sleep in a lot. Please stop posting pictures of your adorable orange kitty. I am now thisclose to *begging* for one, whereas before I was just constantly mentioning how much I love orange kitties. Please note my initial comment was posted in a fit of intense jealousy. 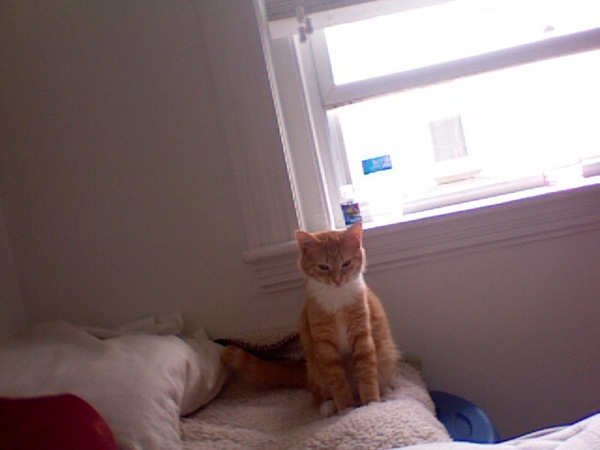 A delightful orange kitty is SO CLOSE in my future, but still several months away, that I just get overwhelmed. Soon we will have Cute Pictures of Orange Kitties pic-offs, or we can make a collaborative blog of cuteness. good. i thought about threatening you. i have a dc friend who fosters kitties, and i could kitten-letter-bomb you. if necessary.